With the release of HelpSmith 7.1 we have added support for the ePub output format making it possible for you to create cross-platform ePub eBooks directly from your help projects. In this post we will overview the key features of the ePub format. ePub is the format designed to create and distribute e-books that can be viewed on any devices including smartphones, tables, desktop computers, or special e-book reader devices. As an open XML-based format and official standard of International Digital Publishing Forum (IDPF), the ePub format is currently supported by the largest number of hardware readers. An ePub eBook is distributed within a single file with the .epub extension that you can view by using an ebook reader application on a specific platform. The key features supported by the ePub Format are: reflowable document size that adapts to the device, fixed-layout content, hyperlinks, page bookmarking, support for images, and also support for CSS styling similarly to an HTML page. On the Project tab, click Compile. In the Output Format box, select ePub eBook. Once your ebook has been compiled, you will find the generated .epub file in the destination directory. By default, HelpSmith puts the ePub file to the same directory where the source help project (.HSM) file is located. However, you can also specify a different output directory in ePub-related settings. While working on your ePub eBook, you can use any features provided by HelpSmith including hyperlinks, text variables, topic templates, images (including images with annotations), etc. If you need to generate different versions of the same ebook, you can also use the HelpSmith’s conditional compilation capabilities. HelpSmith allows you to define the key parameters of your ePub eBook, such as Book ID, URI, and ISBN. Also you can find flexible settings allowing you to customize the Cover page, and the Contents page of your ebook according with your needs. 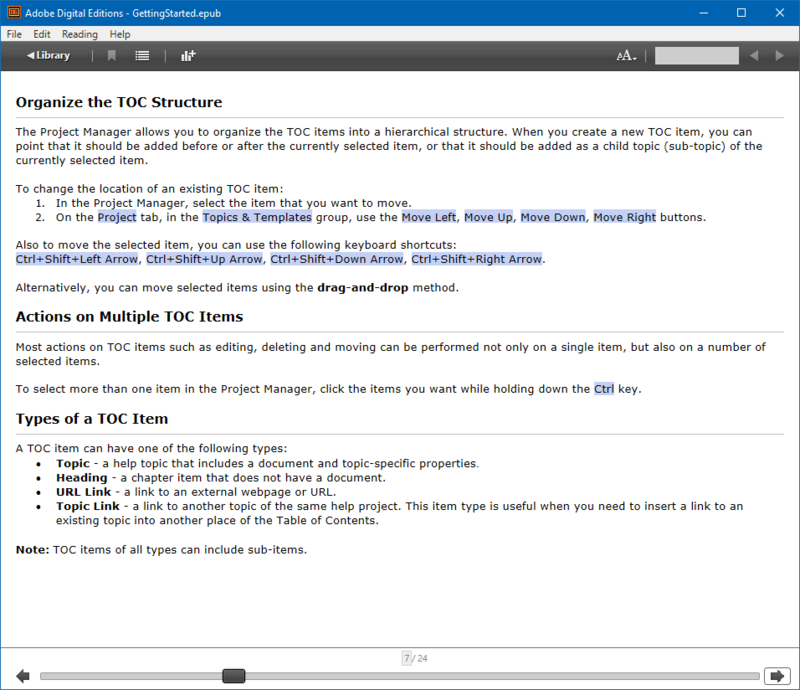 On the Project tab, click Project Options. 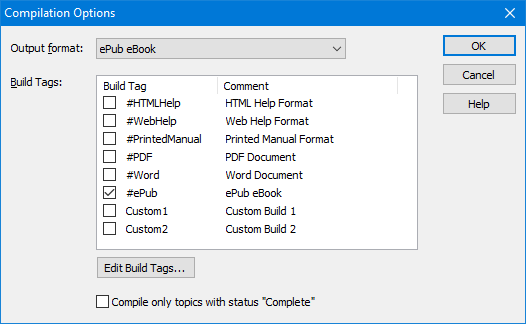 In the Project Options dialog, select the “ePub eBook” section, or a nested sub-section containing the appropriate settings. 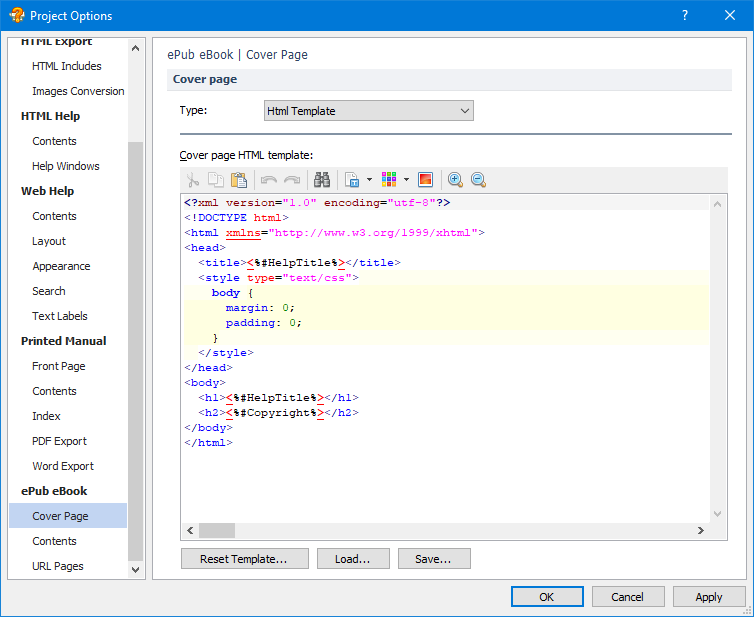 For the Cover page, you can prefer to use a default page that will be generated automatically, a special help topic that you can edit directly with the HelpSmith’s word processor, an image, or you can even use a custom HTML-based template. Similarly, you can customize the Contents page by selecting either a standard (auto-generated) page, or by providing an HTML-based template that you can design according with your needs. There is a variety of applications on different platforms that you can use to view ePub eBooks. For example, you can use Adobe Digital Editions for testing your ePub eBooks created with HelpSmith on Windows. Also, there are reader applications for mobile platforms including Google Play Books for Android and iOS, and Apple iBooks available for MacOS and iOS.